Thoughts from a TV Geek: Willy Wonka: "We are the music makers, and we are the dreamers of dreams." Willy Wonka: "We are the music makers, and we are the dreamers of dreams." Wilder won a Golden Globe for his portrayal of Wonka. It was ranked #74 on Bravo's 100 Scariest Movie Moments for the "scary tunnel" scene. Filming took place in Munich in 1970, and the film was released on June 30, 1971. It received positive reviews, but it was a box office disappointment. However, it developed into a cult film due to its repeated television airings and home video sales. The film received an Academy Award nomination for Best Original Score. Initially considered for the part of Wonka was Broadway star Joel Grey, (Cabaret, Wicked) who ultimately was rejected due to his small physical stature. Wilder said that he would do the film only if Wonka first appeared onscreen coming out of the factory hobbling with a cane, only to then lose it and do a somersault. When interviewed for the 30th anniversary special edition, Gene Wilder stated that he enjoyed working with most of the child actors, but said that he and the crew had some problems with Paris Themmen (who played Mike Teevee), mentioning that he was "a handful" back in the day. The combination to the first door in the chocolate factory is 99-44-100% pure, which was an ad slogan for Ivory Soap. There's a lot of Shakespeare in this film. "Is it my soul that calls upon my name?" is from Romeo and Juliet. "Where is fancy bred..." and "So shines a good deed..." are from Merchant of Venice. The lines to the song "Sweet lovers love the spring time... " are from Shakespeare's As You Like It. Of all the Wonka kids, Julie Dawn Cole is the only one still acting. Peter Ostrum, who played Charlie Bucket, made no other films. He later became a veterinarian. Peter Ostrum went through puberty during the film. His voice is high during the duet of "I've Got a Golden Ticket", and is much deeper later in the film, such as during the Fizzy-Lifting Drinks scene. One of the ten actors who played the Oompa Loompas was female. "There's no earthly way﻿ of knowing, which direction we are going. There's no knowing where we're rowing, or which way the river's flowing." 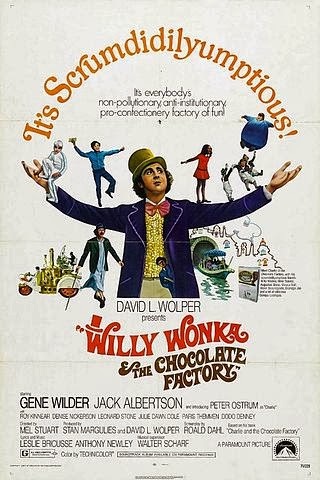 The song Wonka sings on the boat ride are the only song lyrics taken directly from Roald Dahl's book. All other songs were written specifically for the film. Gene Wilder's acting during the boat ride sequence was so convincing that it frightened some of the other actors, including Denise Nickerson (Violet). They thought that Wilder really was going mad from being in the tunnel. The flower-shaped cup that Wonka eats was made of wax. Wilder had to chew the wax pieces until the end of the take, then he would spit them out. The chocolate river was made of real chocolate, water, and cream. It spoiled fairly quickly and left a foul smell. Charlie's stunned reaction to Wonka yelling at him is real. Director Mel Stuart said that Peter Ostrum was not told beforehand that Willy would be yelling at Charlie. Stuart felt that doing it that way would allow for a better, more real, reaction from Charlie.